I’ve had a Yahoo! .co.uk email address for donkeys years. And I’ve always been thankful for having POP access to this account so that I can work with it from within my desktop mail client. These were the same as they had been years ago when I’d first setup my mail client to access my account. So I couldn’t understand why it wasn’t working anymore. 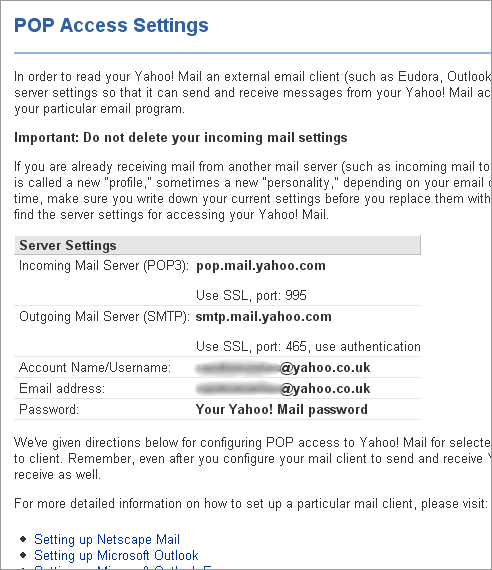 I am now managing to send a few emails using smtp.mail.yahoo.co.uk (SSL port 465). POP3 (through pop.mail.yahoo.com) still seems to be working fine. So it appears the SMTP service is just very poor rather than removed. I guess the non-plus service is just even more minus than before; especially the free SMTP/POP that UK users have but has been denied US users for some time. I’ve just changed from SSL to ‘TLS if available’, and port 587. This is on smtp.mail.yahoo.co.uk. Suddenly it is working fairly reliably and fast after days of complete rubbish. I used to find smtp.mail.yahoo.com slightly better than .co.uk, but now it seems to be dead. Maybe Yahoo have tightened up their ‘free’ rules, and now provide nothing for .com, and no SSL for .co.uk. If so, it would have been helpful to tell us. I tried out these settings and now everything is working again. It’s just disappointing to see that Yahoo! haven’t communicated this properly with their customers. And this isn’t the first time they’ve demonstrated poor customer service. Anyway, I hope the above information helps anybody who was stuck on the same issue as me.